Sweet treats are just staples in the buffet or dining table on any special occasion; well most especially in the most colorful time of the year, Easter. So whether you’re looking to serve a kid-friendly dessert that will easily satisfy their sweet tooth cravings or a beautiful sweet ending that is worthy enough to be on your Instagram feed or Pinterest board, allow us to give you more inspiration. Preheat your oven to 180C. Cream the butter and sugar until light and fluffy. Beat in the eggs until well combined. Gently stir in the flour and vanilla. If you're using a mixer, do this slowly or by hand (to avoid over-mixing). Split the mixture into 4 bowls (about 500g in each). Leave one plain and colour the others with a super teeny tiny bit each of yellow, pink, and purple until they reach the pastel shade you prefer. Prepare 4 (or 2 at a time if you only have 2) 7" tins. Spray or brush with oil then line the bottom with baking parchment. Spoon each of the mixtures into a tin and bake for about 25 minutes or until just cooked and a skewer comes out clean. If you've only baked 2 of the sponges, wash them out, prepare them again and bake the remaining 2 lots of batter. When the cakes come out of the oven, leave to cool in the tin for 5 minutes and then turn out onto a wire rack. Meanwhile, make the icing. Beat the butter until very light, pale and fluffy (about 5 minutes in a mixer or 10 by hand). Beat in the icing sugar until total combined and fluffy. Stir in the vanilla. If the icing is a little stiff, add a few drops at a time of boiling water and beat in until fluffy and 'floppy'. Now to colour the icing, spoon out 2 lots, each of 200g of icing into separate bowls. Colour these pastel yellow, pink, and purple icing, using a tip, end of a knife tip, of a tad bit of gel colour to create that ombre effect. Level the cakes and then use the remaining, uncoloured icing to sandwich the cakes. Cut out the centre core to your preferred size. Just make sure you have enough Mini Chocolate Eggs to fill it with. So better start small then gradually adjust. Fill with the colorful Mini Eggs. 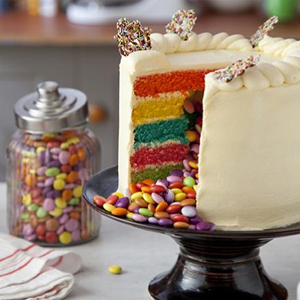 Use the coloured icing to cover the cake with an ombre, graduated colour effect. Dollop any remaining icing on top to 'glue' a small mountain of Mini Eggs on top to form a design. Serve (or take a snap first), then enjoy! Melt various colors of coating chocolate in heatproof bowls according to the package directions. If you’re using white chocolate, simply use the Chefmaster Liqua-Gel to make chocolate in various colors. Use all the colors you like. Fill piping bags or paper cones with each color. Store the piping bags under the foil on the heating pad to keep the chocolate fluid while you work. Use a pencil to trace the outline of egg-shaped cookie cutters on a piece of parchment paper. Cut the paper into little squares with an outline on each square. Flip one of the egg templates over onto a tray or cutting board. Fill in the outline of the egg with one of the coating chocolate colors. Don’t worry about being precise! The outline is there just to make sure you marble enough chocolate to fill your cookie cutter. Steady the piece of paper with your fingertips and swiftly tap the tray against your work surface to spread and smooth the chocolate out. Working quickly and confidently, pipe lines of chocolate in different colors. Start at one end and drag the tip of a tooth pick through the lines. Wipe toothpick clean then drag the next row in the opposite direction. Repeat across the entire surface. Tap the tray to spread the lines flat. As soon as you you finish your design, press one of the egg-shaped cookie cutters into the chocolate. Set it aside to harden, about 10 minutes. Lift the cutter up and slide the finished chocolate egg out. Flowers: Pipe circles of chocolate within each other. Tap the tray to spread the circles flat. Use a toothpick to drag the chocolate in towards the center to create petals. Hearts: Pipe lines of dots in different colors. Tap the tray to spread the dots flat. Drag the tip of a toothpick through the rows of dots to create hearts. Swirled Flowers: Pipe tiny dots of chocolate in one color. Top the dots with smaller dots in another color or white. Tap the tray to smooth the dots flat. Swirl each layered dot with the tip of a toothpick. Pipe tiny green dots toward the edge of each swirled dot. Drag the tip of a tooth pick though the dot out away from the flower to create a leaf shape. Tap the tray to smooth the whole design out. Preheat the oven to 400° and position racks in the upper and lower thirds. Line 2 baking sheets with parchment paper. In a large, wide bowl, using a large rubber spatula or a handheld electric mixer, mix the confectioners' sugar and almond flour with 1 of the egg whites until evenly moistened. In another large bowl, using clean, dry beaters, beat the remaining 2 egg whites at medium-high speed until soft peaks form. With the mixer at high speed, carefully drizzle the hot sugar syrup over the whites and beat until firm and glossy. If you’re concerned that the meringue won’t hold up, add a pinch of cream of tartar for stability and added volume. Beat in the food coloring until the meringue already has your desired shade. Don’t overmix as it will deflate your macarons. Stir one-fourth of the meringue into the almond mixture. Using a rubber spatula, fold in the remaining meringue. Transfer the meringue to a pastry bag fitted with a plain 1/2-inch tip; pipe onto the prepared baking sheets in egg shapes, 1 inch apart. Tap the sheets and let dry for 15 minutes. Letting the meringues dry before baking is a crucial step. You’ll know they are ready to bake when they lose their sheen. Transfer the meringues into the oven and immediately turn off the heat. Bake the meringues for 5 minutes. Turn the oven on to 400° again and bake the meringues for 8 minutes, until they are puffed and the tops are firm and glossy. Transfer the baking sheets to racks and let cool completely. Peel meringues off of the parchment paper. Now decorate the meringue shells with food coloring and small-tipped paint brushes. Don’t forget to have fun doing it! Spoon your choice of filling into a small pastry bag fitted with a 1/4-inch tip. Alternatively, use a resealable sturdy plastic bag and snip off a corner. Pipe the filling onto the flat sides of half of the meringue. Top with the remaining meringues and serve.